Just an update on the cutting down on sugar in my life. It’s been a very l-o-n-g time since I have been this faithful to any kind of diet change. I can’t remember (well, yes I can actually) the last time I went on a successful diet and lost weight. But I’m not exactly doing this to “lose weight,” per se, but to feel healthier. It’s true. Sugar brings you/me down. I have always known this but I am stubborn and have been addicted to certain things for my entire life, sugar being one of them. Pizza is another of them, and salty foods. All not such great choices, thus my unhealthiness. At 67 1/2 years of age, it’s almost too late to change now, but on the other hand, why the hell not? Right? Anyway, I only eat twice a day. I cannot do breakfast. However, I have now begun to eat a kind of breakfast, albeit around noon, consisting of a bowl of “steel cut” (because that’s the kind Paul got at the store!) quick cooking oats with one or two kinds of fruit added… it’s quick and easy and good. I add a sliced banana and some raisins which naturally sweeten the oats that just get a cup of boiling water added to 1/2 cup of oats. Winter is coming and this breakfast/lunch makes sense to me. The next meal I deal with is supper. And that is now some kind of protein (meat/fish) and veggies. Nothing processed. Well, almost nothing processed. I make our own bread here in a bread machine – one kind for Paul (10 grain) and one kind for me (Italian cheese, or 9-grain), so when I have some bread, it’s only one slice, and since I make the bread, I can slice it as thinly as I want. For a sandwich I will slice it thinly and cut the one piece in half and have a half-sandwich. I got some extra-thinly sliced Swiss cheese and boiled ham at the food store and the other night, I dreamed up the most incredible dinner ever! Turns out that my dreamed-up dinner had (sort of) already been dreamed up by others… I found it online yesterday! But I thought it up on my own before I saw it online. Just for you, I will give you the recipe here: I haven’t a name for it yet, but it’s similar to the Croque Madam, if you’ve ever heard of that. There are 3 pans needed (including for the side of tomatoes). 1) In a small toaster oven pan, line it with parchment paper or foil. 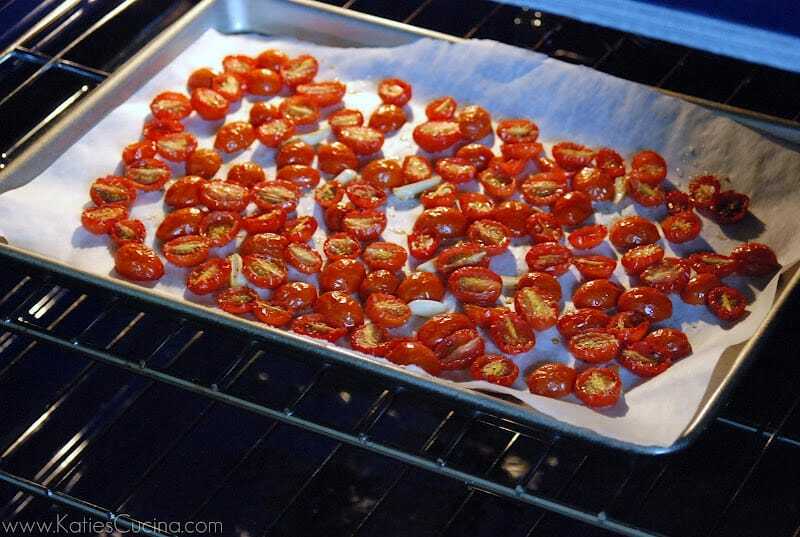 Cut up about 10-20 cherry tomatoes in half and sprinkle them with olive oil, salt, pepper as you like. Mix them into that and lay them in a single layer. Bake them in the toaster oven til just sizzling…about 15 minutes on about 375… keep checking on them, they are roasting but don’t burn them. 2) In a large flat frying pan, put two pieces of really good whole grain bread down – buttered – with the buttered side down. Spread some nice grainy mustard on each bread top in the pan, (I used Nathan’s Deli Mustard). Then lay some washed/dried pieces of nice dark green KALE on the mustard to cover the whole bread. Top the kale with 2 thin slices of Swiss Cheese and then 2 thin slices of boiled ham, and then 2 more thin slices of Swiss Cheese. Turn the heat on medium under the pan and put a LID ON IT! Be careful not to burn the bread. Let it all warm up so the cheese melts and the kale gets a bit wilted. 3) In a small fry pan, put a bit of oil and get it hot, break 2 eggs (for 2 people) into the pan, trying not to break the yolks. Cook until the bottoms are done and spoon the hot oil from the pan up over the tops a few times to cook the tops. Put a cover over this for a bit to steam it and get the tops cooked. Serve the “sarnies” (a Yorkshire word for sandwiches) on a plate, with the roasted cherry tomatoes on the side and the sunny-side-up egg on top of the open-faced sarnie. Paul was skeptical. I wasn’t because I dreamed it up! The kale was genius, I have to admit. It made the whole thing great. The egg also made it great. A Croque Madam (or Croque Monsieur) has bechamel sauce on them, but mine didn’t. It was so good – you must try it. Paul was going nuts! And he never goes nuts over my cooking! Almost never, anyway. He gobbled his up so fast… I should have made an extra one for him… but he said one would be enough! I can’t wait to try these again, since I still have the ham and Swiss cheese in the fridge. I like it with just the one piece of bread on the bottom, no top slice, or “open faced.” You eat it with a fork and knife, of course, but wow, is it EVER good. And the roasted cherry tomatoes with it are perfect. Oh, and I did buy that book recommended to me by Nancy called “The Belly Fat Cure” and wow, recipes galore in there. The only problem is that almost every recipe has an item or two that I never buy so I don’t actually have all the ingredients here for most of them. But as I go along, I plan to make more of them. Well, just for the record folks… I am using the whole milk in my coffee and it rocks. Plus I got the Stevia in the mail and put 4 drops in my cuppa and it was perfect. No really sweet either, like it is with sugar, but not that bitter taste like with no sugar. So I’ve got that problem licked. Thanks for all the good info everyone! The fat can be taken in from another source, i.e. butter or olive oil. NOT MARGERINE-worse type of fat for you. I watch my milk and cream intake. Use cream instead of milk, use less. Maggie is right about Vitamin D being necessary to assimilate calcium. No, we don’t know each other – hope the comment did not alarm. I follow a few blogs but never have much to say! I commented on yours as I drink whole milk for the health reasons noted by others, and also because I love strong coffee and drink it in a cafe au lait style or otherwise on ice with whole milk with a drop of vanilla. Without whole milk, I would rather drink it black! 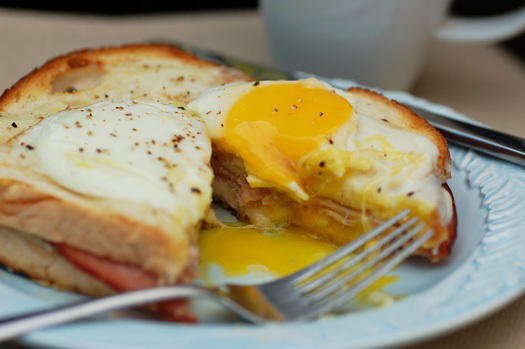 OMG that egg sarnie looks delicious! And healthy too. I’m adding it to my list of things to make. It sounds like you’re really motivated. I agree about the steel cut oats. I really like the texture better than regular oats. I really think we get addicted to added sugar and salt. It’s really worth it to eat a healthier diet that kicks refined sugar to the curb. This Harvard article has a lot of info on calcium, no mention of milk fat, that might be where the Vitamin D comes in, as it is fat soluble. Thank ATI for the internet. I learn so much here. Nora, thanks for that tip about calcium and milk. I changed my order to whole milk for this week (I get my food delivered by PeaPod lately) so tomorrow we will have whole milk. The reason I jumped on this news you gave me about milk fat and the calcium is because Paul just had his bloodwork done by his endocrinologist (he has no thyroid) and under the calcium, it was a tad low. I said to him “geeze, you drink milk in your cereal every day and you eat ice cream… why should it be low?” – – well this might give us a clue! So he’s getting whole milk from now on and we’ll see if his numbers go up next time! Most likely Juniper recommended whole milk because we need the fat to assimilate the calcium. 2% is the lowest you can go. I understand your dislike for it though. Hi, Bex! Sounds like you’re moving toward making this a permanent lifestyle change. Good for you! The steel cut oats are the best thing for you, when it comes to oats. Less processed, more nutritious. I usually make a simple muesli with mine by taking yogurt, oats, a few nuts, seeds, and small pieces of dried fruit and mixing them together. Often I have to add a bit of water to thin it down just a little. Let it sit a few minutes and the oats soften up, or you can make it the night before and sit it in the fridge overnight. Your sarnie looks tasty! I’d have it with only one slice of thin bread, too. Juniper (do we know each other?) – I haven’t bought whole milk in a few decades now. I used to think 1% or 2% milk was just horrid until we switched to the 1% and now I love that. I can’t go back. It’s too rich tasting to me now! Even hubby who thought he’d NEVER like it, loves it now. It’s so much lighter tasting. I don’t use a lot of milk either. Thanks for your comment! Put whole milk in your coffee! Forget 1%. Sounds like you are doing well with your diet. I’ve tried many different diets for health reasons and found them all interesting but not always satisfying. Congrats on sticking to this one. Sugar can cause a lot of probs and I just recently learned cancer loves sugar which really shouldn’t surprise me. My diet goal is to be vegan but I am not past the vegetarian stage yet. The switch over seems like a lot of work but I’m sure it isn’t it just takes determination (and $) which I have seemed to have lost over the years. I did not realize you were so close to my age! Don’t wait for us to live closer, Maggie… make them for you and Attila! Soon! Paul got kale from the market last week. It was humongous! The bundle of it had to be 2 feet long! Like a huge bouquet of flowers! I got rid of all the stems and took all the leaves off and washed and dried it and stuck it all in a very large zip-lock bag. So I just unzip and pull out a few pieces at a time. We are having a kale salad for supper tonight with our small piece of steak and maybe some acorn squash that I need to cook up. Bex, that does sound yummy. Thanks for sharing it. Too bad we live so far apart, otherwise I might be trying to persuade you to invite me over for a lunch of Ham/Cheese/Egg Sarnies! Drooling here Bex, wow, those look so good! My Grandpa, who died suddenly of heart failure, in his prime, at 90 years of age, ate a LOT of sugar. He ate a bowl of maple syrup from time to time. He liked chocolates and ate them at Christmas time. He loved homemade pie, and topped it with generous spoonfuls of white sugar and heavy cream. He was healthy, alert, and active until his sudden demise, mid-sentence. He only ate maple syrup and white cane sugar. He never ate glucose/fructose, which is the main sweetener in almost all pre-prepared foods these days. I too love sugar, and it is a huge concession on my part to pare my consumption down to 5 teaspoons a day, or less, of maple syrup or white cane sugar. I avoid glucose/fructose like the plague.